Stray Dog - What to do about stray dogs. Stray Cat - What to do about stray cats. Pigeons - Pigeon control methods. Geese - How to get rid of Canada Goose. Starling - Control these pest birds. Muscovy Ducks - Remove these problem ducks of the south. Woodpecker - Get them to stop pecking your house. Chipmunks - Trapping and removal of chipmunks. Deer - Get them to stop eating your plants. Flying Squirrel - A common nocturnal animal in attics. Gopher - Remove these burrowing critters. Feral Hog - Specialized trapping for large pigs. Muskrat / Nutria - Control of these aquatic animals. Otter - How to prevent cute otter problems. Porcupine - Removal of these quilled animals. Rabbit - Garden eating rodents. Vole - How to prevent them from destroying a lawn. Weasel - Removal of unwanted weasels. 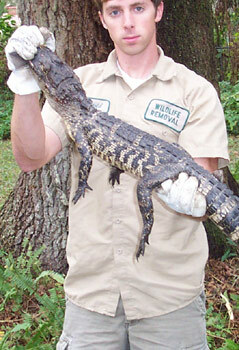 Alligator - Specialized removal in Florida and Louisiana. Iguanas - A problem in south Florida. Many people actually use the generic term "rodent" in order to describe any kind of nuisance critter. I've heard people call raccoon, opossums, even armadillos rodents. While it's true that many members of the rodent order are pest animals, most are not actually rodents. The most common nuisance animals that are in fact rodents include: mice, rats, squirrels, muskrats, woodchucks, nutria, and beavers. HOW DO I GET RID OF RODENTS? As with pretty much all of the nuisance wildlife species discussed on this website, the only sure way to eliminate a problem is through integrated pest management: trapping and removal, and identification and elimination of attractants. If you've got rodents in the attic, you've got to find out how they're getting in, trap and remove them, and seal shut all of their entry points. Eliminate food sources, habitat, etc. CAN'T I JUST USE A REPELLENT? There is no effective rodent repellents available. You can find some products on the market, such as mothball-based or urine-based repellents, but they are bogus. Go ahead and try them. And those high-pitch noisemakers, also called ultrasonic sound emitters, do not work. There is no quick and easy fix when it comes to rodent removal and control. It's best to have a professional trap and remove the animals properly. You�ve read and absorbed everything there is to know about trapping your critter. Big or small, there�s an animal trying to get the better of you and you want some special tips. If I had a golden book of secret animal trapping hints, I probably wouldn�t divulge all of its mysteries on a public website, but, since there is no such book, here are some trapping tips that will help you in any animal trapping situation. Tip #1: A little knowledge goes a long way. If you were about to march into battle against an enemy, you�d want to know everything about it. What are its strengths? What are its weaknesses? Can it shoot lightening out of its eyes, and if so, what kind of lightening does it shoot? Granted, pest control usually isn�t a kill-or-be-killed situation, but it does pay to know a little about the animal you are after. Animals are creatures of instinct and habit. Knowing about diet, mating behavior, social behavior, and habitat will give you clues on how to safeguard your home or oust an unwelcomed guest. Tip #2: Select your weapons carefully. Let�s take poisons out of the equation. Poisons are not only a horrific, agonizing way for any living creature to end its life, they open up the potential for that animal to crawl into an inaccessible part of your home and die. The resulting odor will be a karmic reminder of choosing a humane way to deal with pests. If you must use a lethal trap, choose a snap trap or body-gripping trap specifically made for the size of the animal you are after. For larger or predatory pests, live-traps offer a way to safely remove and relocate the animal. Tip #3: Just because you can�t smell them doesn�t mean they can�t smell you. You�ve picked your trap, now you need to take care not to give yourself away. Animals can smell a host of things humans cannot, and a trap covered in human odor will not attract the target animal. At the very least, use gloves when handling your trap. Scent covers, available in hunting stores, can be used if additional coverage is required. Tip #4: Employ common sense. Traps that are scent-protected are of no use if you don�t know where to place them. Using Tip #1, employ your knowledge of the critter and devise a way to make your trap most effective. By utilizing frequented paths, trails, dens, and burrows, you can ensure your trap has the best chance of catching the desired prey. Tip #5: Do not throw caution to the wind. Caution is a very useful tool when dealing with wild animals. Not only do you need to know the laws pertaining to wildlife capture and removal, you need to make sure the laws are followed. Using caution also applies to animals that can harm you with tooth and nail or with zoonotic diseases. Tip #6: Call a professional. Why take a risk when it comes to wildlife? If you are researching wildlife removal, your problem has progressed to a point where intervention is required. A professional wildlife remover will have all the knowledge, equipment, and contacts needed to handle your situation appropriately. By hiring an expert, you eliminate the variable of inexperience. These tips apply to almost every critter trapping situation. While there is no golden book, you can eliminate many pests from your home or business on your own, as long as you are armed with the appropriate knowledge. Do your research, evaluate the situation, and if you can handle it safely on your own, do so with confidence. Click here for a nationwide list of 100's of professional rodent trappers serving all 50 states.